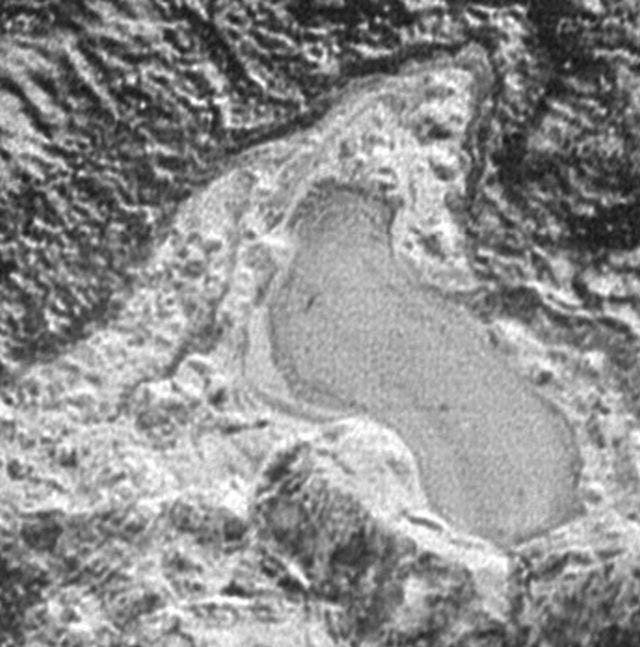 NASA's New Horizon's spacecraft has captured appears to be a frozen, former lake of liquid nitrogen, located in a mountain range just north of Pluto's informally named Sputnik Planum. Captured by the New Horizons' Long Range Reconnaissance Imager (LORRI) as the spacecraft flew past Pluto on July 14, 2015, the image shows details as small as about 430 feet (130 meters). At its widest point the possible lake appears to be about 20 miles (30 kilometers) across. "In addition to this possible former lake, we also see evidence of channels that may also have carried liquids in Pluto's past," said Alan Stern, Southwest Research Institute, Boulder, Colorado—principal investigator of New Horizons and lead author of the scientific paper.